Salesforce Transit Center Floating Away? The recently completed Transbay Transit Center in San Francisco now named the Salesforce Transit Center, has been closed after the discovery of two separate cracks in structural beams in the $2.3 billion, 1500-foot-long facility designed to replace the old Transbay Transit Center that was closed in 2010. According to articles, the cracks were discovered by a worker as the ceiling was being laid on the third floor of the facility. That structure supports a five-acre 4.5 block long park above and supports the second floor below. Work was stopped, the contractor and the City of San Francisco, as they should have, immediately closed the facility until further notice so that the cause, whether from the weight of the facility or from faulty manufacturing, could be determined. The challenge is to determine the cause – whether faulty design or a loading problem – and then to design and erect a “fix” that will avoid any future problems or potential harm to the users of the facility located adjacent to the 1,070-foot-tall 61 floor Salesforce Tower. This is a serious matter and shoring of the two beams (subscription required) is underway to protect the users of the facility from harm. The beams where the cracks occurred span Freemont Street, a heavily trafficked street in the district. The contractors have installed six jacks to shore up the beams while engineers and materials experts inspect the welds and the material of the beams. 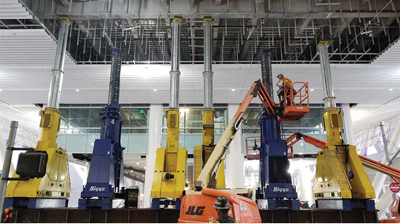 According to ENR, “Skanska USA Civil West held the $189.1-million subcontract to furnish the building’s 23,000 tons of structural steel and erect the entire system, including the building’s exotic exoskeleton (ENR 6/29/15 p. 40). The landmark SalesforceTower, owned by Boston Properties, Inc., developed by co-owner Hines, was built by a JV of Clark Construction Group and Hathaway Dinwiddie Construction Co. The design architect for the complex was Pelli Clark Pelli Architects and the architect of record was Kendall Heaton Associates, Inc., headquartered in Houston. Salesforce Tower was completed in August of 2017 after 10 years and one major recession of construction. Salesforce Tower was just announced as an ENR award winning building in its annual best project competition. The transit center is also built adjacent to the Leaning Tower of San Francisco, the Millennium Tower, which has had foundation problems that we have discussed in previous posts. The Transit Center problems are not the same as the Millennium Tower though. In fact, they may be just the opposite. The piers under the Millennium Tower support the weight of the tower, but the Transit Center is so “light” that the structure’s piers are meant to “tie it to the ground” since it is called, according to the San Francisco Chronicle writers Matier&Ross, "a 1,500-foot-long barge floating atop a lake of deep mud." Phase two of the transit facility, when funded, will focus on the development of the train box that is under the completed Phase One garden and bus transit station. You can see a video of the Transit Center here. Oh yes, Salesforce Transit Center might not be floating away, but it seems to be cracking around the edges. Let’s hope that the engineers can come up with a permanent fix for these issues. We will continue to track this one. No pun intended. Spotlight >> Don't miss these! Construction Citizen is your headquarters for leading-edge stories, valuable information, and insightful perspectives from the heart of the construction industry. With resources that span the world, our mission is supporting sound business practices, ethical conduct, and an ever-expansive professional base for the building community. We're here to partner with you, sharing what matters most to craft professionals, project managers, and business owners within the construction industry.